When Ichiro appears in a 2018 regular-season game for the first time, he will be the oldest player in Mariners history, eclipsing Hall of Famer Gaylord Perry. On Opening Day March 29, Ichiro will be 44 years, five months and six days old. Perry was 44 years, one month and seven days when he last pitched for the Mariners June 22, 1983. After the Chicago White Sox banged him around for five earned runs on 10 hits that day, Perry received his release. Hard to tell how long Ichiro will hang around. He’s on the roster on a one-year deal due to a spate of outfield injuries, notably the strained oblique by LF Ben Gamel, who is expected to miss four to six weeks. Gamel’s absence, coupled with a bankrupt farm system, forced the Mariners to look outside the organization for a fourth outfielder. 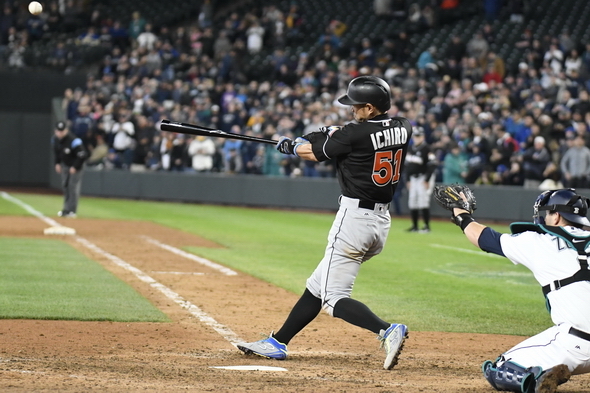 They seized upon Ichiro, who will earn induction in the Hall of Fame five years after he retires, entirely due to his exploits in Seattle from 2001-12. They included 10 All-Star appearances, 10 Gold Gloves, a record 10 consecutive seasons of 200+ hits (MLB record 262 in 2004), a .328 batting average, a regular-season MVP, an All-Star Game MVP and a Rookie of the Year award. But that Ichiro hasn’t existed for half a decade. In nearly six years with the Yankees and Marlins, Ichiro is a .260 hitter without one season of 400 at-bats or 150 hits. He’s twice had a negative WAR, including -0.3 last year. Since departing the Mariners in 2012 to help facilitate a Seattle roster makeover that plainly didn’t work (no playoffs, four losing seasons, no division finish higher than second), Ichiro has enjoyed two major moments. He collected his 3,000th hit with a triple off the wall at Coors Field Aug. 6, 2016, and hit a ninth-inning home run off Evan Marshall April 19, 2017, in what many assumed would be his final at-bat at Safeco Field. Now he’ll get another, and perhaps many more, depending on Gamel’s recovery and what Ichiro is able to deliver in his baseball dotage. In the past four decades, the Mariners have employed nearly two dozen players age 40 and older, notably LHP Jamie Moyer, OF Raul Ibanez and DH Edgar Martinez. To that trio we could add Perry, who won his 300th game in a Seattle uniform May 6, 1982 at 43 and recorded 13 wins in his age 43 and 44 seasons (1982-83). At 40 in 2003, Moyer went 21-7 (only 20-win season of his career) and became the third-oldest player to make an All-Star team for the first time. He won an additional 26 games before the Mariners swapped him to Philadelphia in mid-2006 for minor leaguers Andrew Baldwin and Andy Barb, neither of whom saw the state of Washington. Moyer lasted in the majors until 49, when he went 2-5 for Colorado. But he had a 16-win season for Philly at 45 in 2008 and a 12-win campaign in 2009. Ibanez had 29 home runs at 41 in 2013. Martinez hit .294 with 24 homers and 98 RBIs as a 40-year old in 2003. Ibanez departed in free agency at the end of the 2013 season and Martinez retired a year later. Most of the Mariners age 40 and up didn’t contribute much. In fact, most didn’t last a full season. Given that Ibanez and Martinez are the only plus-40s to reach 100 hits in a season, and given that they were both three years younger than Ichiro when they did it, it’s difficult to imagine Ichiro contributing much. All of the following, except Ichiro, performed for the Mariners after turning 41. The listed age is what Ichiro will be on Opening Day, 2018, and how old the remaining players were, in years, months and days, on their last days in a Seattle uniform. Ichiro has more hits than everybody who has ever played baseball, except for 20 guys. Guys with names like Willie Mays, Honus Wagner, and Stan Musial. Someone asked if Ichiro would speak English to the Seattle media this time. I, um….. I think I can understand why he doesn’t speak English to the media. “A” for Effort, though. And, unlike Perry, Ichiro has never been caught cheating and likely won’t have that black mark on his resume when he goes into the Hall. No tainted numbers for this guy.